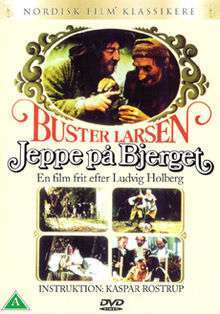 Jeppe på bjerget is a 1981 Danish film directed by Kaspar Rostrup and based on a play by Ludvig Holberg. It won three Bodil Awards : Best Film, Best Actor (for Buster Larsen) and Best Supporting Actor (for Kurt Ravn). It was also entered into the 12th Moscow International Film Festival. It directly translates to Jeppe on the mountain. ↑ "12th Moscow International Film Festival (1981)". MIFF. Retrieved 2013-01-25.